Posted April 1st, 2019 by alexa & filed under Families. It was Mother’s Day in the UK yesterday – hope you all had a great day! Thinking about all you amazing mothers out there I just wanted to share this natural family portrait with you. It was from a wonderful London vacation photography session I did towards the end of last year. It’s such a beautiful moment between these two sisters and their mum, who they obviously both adore. I met up with this lovely American family to photograph them while they were on holiday in London. We chose Hyde Park for their vacation photography session as they were staying a short walk away in Kensington. The family consisted of the grandparents with their two daughters, their son-in-law and grandson. We started the vacation session taking lots of natural family portraits of them all enjoying their time together on this special London holiday. We also captured some great candid photographs of the little boy running around the park. He was having so much fun exploring Hyde Park and playing with all the Autumn leaves. The two sisters were keen to get a few relaxed images of them with their mum. They sat down on a fallen tree trunk and chatted about their vacation while I clicked away. I particularly love this photo where one of the daughters is giving their mum a squeeze, while the other looks on smiling. You can tell how close they are as a family and I was delighted to capture this special moment for them. If you’d like to get some natural portraits of your family, please do get in touch. 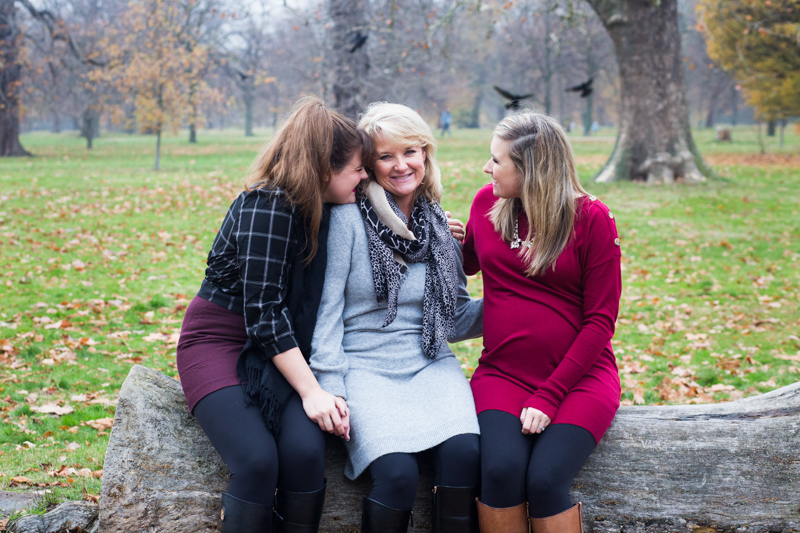 Whether you live in London and would like to book a family photography session in the place you call home. Or if you’re coming on holiday to this fantastic city and would like to organise a London vacation session I’d love to meet you and photograph your unique family.